If you want to benefit from all the features of HTML Executable, you may prefer to acquire a license for the Professional edition. The Commercial edition does not contain any restrictions, compared to other editions. You can always upgrade to another edition when you want (Personal -> Pro, Perso -> Commercial ou Pro -> Commercial): please contact us if you wish to do so. If you are not sure, you can begin with a Personal edition without any problem and upgrade in a later stage. After placing your order, you will receive instantly license details by email with instructions on how to upgrade from Trial edition to the Registered one. If you already have your registering notice, connect to your account here. All the prices listed are for a user license of HTML Executable. 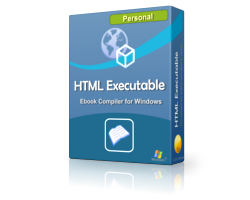 You can install a final-user license of HTML Executable on a reasonable number of machines providing that the registered user (Named User) is the only individual permitted to use HTML Executable. Prices are subjects to applicable local sales tax/VAT if any. Prices in Euro are mandatory for orders from within Europe. Prices are subject to changes without notice. When you purchase a license, your activation key will always work with the version of HTML Executable you purchase. In addition to the license key, you are given a 12-month maintenance. If you let your maintenance expire, upgrades will cost you 70% of the new license price (20% more than one-year maintenance). The Trial edition of HTML Executable is a full-featured release. This means that the same capabilities available in the registered software are present in this Trial edition, except that the Registered editions will never put nag messages at startup nor automatic expiration dates in the output publications. Moreover, you are not allowed to distribute ebooks made with the Trial edition. The goal of the Trial edition is to let you try out all the features of HTML Executable: you can, therefore, see if it works for you. Although the Trial edition does not contain a time-out feature, we ask you to purchase a registered license after 30 days if you are interested in using HTML Executable. If you are a registered user and you want to upgrade your license to HTML Executable 4, please visit this page.